With the first cooler days of autumn creeping in I fancied a robust flavoured, meaty dish. One of my favourite meat dishes is duck in any form or shape. I managed to get a stock of raw, frozen duck legs from Rougie in Sarlat and I created a recipe around them. I also have some beautiful fruit sauces made by Belberry at the shop, one is with blackcurrants. 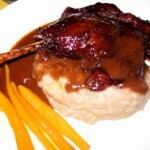 In this recipe I slow cooked the ducks’ legs in a red wine marinade then basted them with the blackcurrant sauce. This recipe can be prepared the day before serving, then the duck is reheated and basted prior to serving. I needed sweetish vegetables to accompany the dish so I chose baby carrots in honey and mashed potato mixed with puree of chestnuts. Wash the ducks’ legs and remove any small chips of bone. Cover with the lid and slowly cook in the oven for 150 minutes (2 ½ hours). Once cold remove the thick layer of fat from the cold meat juice. Prior to serving, preheat the oven to 150C degrees. Pour the Belberry blackcurrant sauce over the duck legs and turn each piece so that they are well coated. Place in the oven for about 20 – 30 minutes until hot. Baste regularly. Pour into a sauceboat and serve hot with the duck. 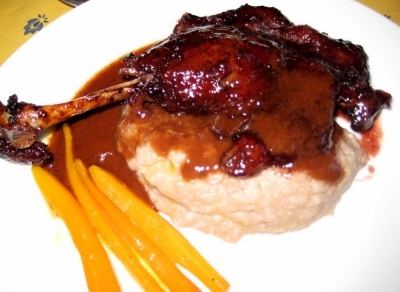 I suggest serving the duck with sweetish vegetables such as baby carrots cooked in butter and honey and mashed potato blended with puree of chestnuts. I recommend serving this beautifully flavoured dish with a good Merlot.